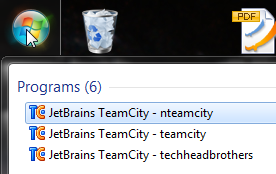 TeamCity Tray Notifier is used normally to watch builds and receive notifications from a single TeamCity server. Optionally, for each of the Tray Notifier instances you can specify explicitly the URL of the the server to connect to with the /server option. 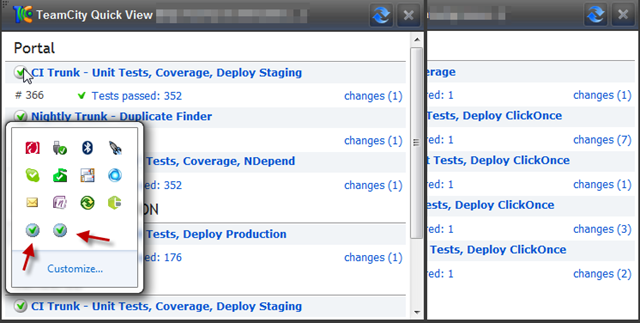 Otherwise, for each further tray notifier instance you will need to log out and change server’s URL via UI. See also details in the issue tracker. To achieve this I created three shortcuts with the different servers configuration and then I placed the shortcuts in my folder C:\Users\Laurent\AppData\Roaming\Microsoft\Internet Explorer\Quick Launch\User Pinned\StartMenu in which it is indexed.